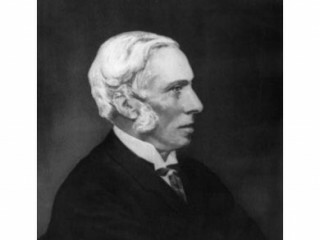 Richard Norman Shaw was an influential Scottish architect from the 1870s to the 1900s, known for his country houses and for commercial buildings. Shaw trained in the London office of William Burn with George Edmund Street and attended the Royal Academy classes, receiving a thorough grounding in classicism, and met William Eden Nesfield, with whom he was briefly in partnership. In 1854 – 1856 he travelled with a Royal Academy scholarship, collecting sketches that were published as Architectural Sketches from the Continent, 1858. In 1863, after sixteen years of training, he opened a practice for a short time with Nesfield. In 1872, Shaw was elected an Associate of the Royal Academy. He worked, among others, for the artists John Callcott Horsley and George Henry Boughton, and the industrialist Lord Armstrong. He designed large houses such as Cragside and Grim's Dyke, as well as a series of commercial buildings in a wide range of styles. Shaw was elected to the Royal Academy in 1877, and co-edited (with Sir Thomas Jackson RA) the 1892 collection of essays, Architecture, a profession or an Art?. He firmly believed it was an art. In later years, Shaw moved to a heavier classical style which influenced the emerging Edwardian Classicism of the early 20th century. Shaw died in London, where he had designed residential buildings in areas such as Pont Street, and public buildings such as New Scotland Yard. His picturesque early country houses avoided the current Neo-Gothic and the academic styles, reviving vernacular materials like half timber and hanging tiles, with projecting gables and tall massive chimneys with "inglenooks" for warm seating. The result was free and fresh, not slavishly imitating his Jacobean and vernacular models, yet warmly familiar, a parallel to the Arts and Crafts movement. Richard Norman Shaw's houses soon attracted the misnomer the "Queen Anne style". As his powers developed, he dropped some of the mannered detailing, his buildings gained in dignity, and acquired an air of serenity and a quiet homely charm which were less conspicuous in his earlier works; half timber construction was more sparingly used, and finally disappeared entirely. His work is characterised by ingenious open planning, the Great Hall or "sitting hall" with a staircase running up the side that became familiar in mass-produced housing of the 1890s. He was also involved in ecclesiastical architecture. He restored St. John's Church, Leeds and designed new churches such as St. Margaret's, Ilkley, All Saints', Leek and All Saints', Richards Castle.